If you want to get great snorkeling, comfortable, relaxing cruising and the very best in friendly service, join Roberto Smith and his beautiful lady of the seas " "Winnie Estelle" on one of her lazy day trips to Caye Caulker. You get two long snorkel stops in beautiful aquamarine waters; Coral Gardens which is a huge area of beautiful colorful reefs AND the world-famous Shark-Ray Alley, home to friendly nurse sharks and southern sting-rays galore. 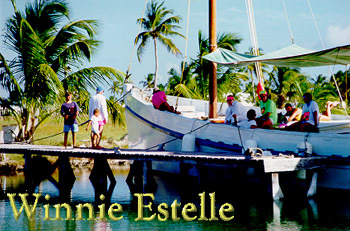 There is dolphin watching on board the "Winnie Estelle" on every trip! There's a Free Bar on board with local rum and beer, sodas, cordials, ice & water available throughout the day. Snacks are served just after each snorkel stop, and include lots of fruits! Lunch isn't included in the cost, but you'll be very pleasantly surprised at the low prices at some of Caye Caulker's great restaurants. During your stay on the island, there's plenty of time for exploring and shopping. After that, it's time to join the Winnie Estelle for the afternoon snorkel stop and the cruise back to San Pedro. It's a FULL DAY of relaxation & fun & freedom ... and isn't that the reason you came to Belize? There is a bathroom and shower on board. 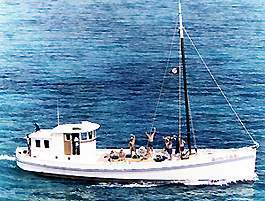 PRICE: Adults $55 U.S., Children $25 U.S.
Captain Robert Smith also offers group charters down the barrier reef islands of Belize to the Rio Dulce. This river coming out of Lake Isobel in Guatemala has the only known fiord on the eastern side of the American Continent. Some miles up river is the historical old Spanish fort, complete with cannons. This is a spectular trip and little known pristine piece of geography. 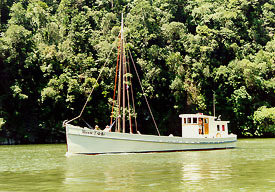 The Winnie Estelle is also ideal for trips to any of the three offshore Atolls outside the main barrier reef of Belize. These are across the open Caribbean Sea and then you enter an oblong reef circle with islands and coral reefs and shallows on the inside. Excellent fishing, scuba and snorkeling. The Atolls are around 50 miles long each and about 10 miles wide with islands on the inside. 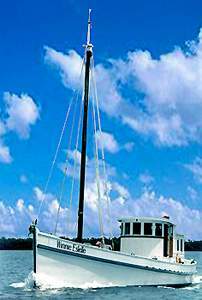 Tobacco Caye, South Water Caye and some of the other well known islands along the Great Barrier Reef of Belize are also accessible to the Winnie Estelle. The distance from the home base of San Pedro to Tobacco Caye is about 85 miles. Goff's Caye National Park is a 40 mile run along the barrier reef. 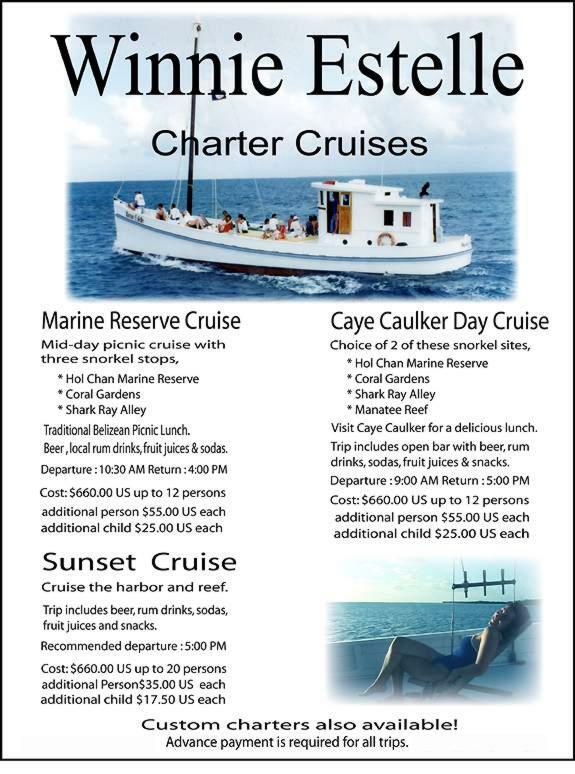 Any trips to these cayes are on a charter basis.